Sometimes things don’t work out. For example, this morning, I dropped my bagel when I was climbing the stairs. Had things gone according to plan, I would have not dropped my bagel when I was climbing the stairs. Unfortunate for me. Arguably unfortunate for the bagel. And then, sometimes, things do work out. For example, last Friday, I chatted a little bit about Keon Broxton. Then while I was away for the weekend, Broxton came through with five hits, including three dingers. It can be hard to know what to write about on the other side of a weekend. Broxton is making it easy. Now I have all the excuse I need to urge you to jump on the Keon Broxton bandwagon. Before too long this train could pull away from the station. To quickly review: Broxton is 26 years old. Before this year, he had all of two major-league plate appearances. Originally signed by the Diamondbacks in 2009, he was grabbed by the Pirates in spring of 2014. Then, almost two years later, the Pirates sent Broxton and Trey Supak to the Brewers for Jason Rogers. David Stearns liked what he was getting — though he expressed faith in Rogers as a big-leaguer, he pointed to Broxton as being a guy with strong speed and defense. In Broxton, the Brewers saw a potential long-term center fielder. There are a few ways to get at that. Optimistically, you could say that when a player has good speed and defense, he has a pretty high floor. On the other hand, potential long-term center fielders typically aren’t traded for guys like Jason Rogers. I think the move was pretty easy to ignore. And Broxton, early on, was very bad. The Brewers wanted to give him a shot. Broxton broke camp. He didn’t get his first big-league hit until May 25. He started 0-for-22 with 15 strikeouts, and Broxton shuttled between the majors and Triple-A a handful of times. More recently, things have started to click. Broxton was last demoted at the beginning of July, and he was last recalled near the end. So now look at this table, which shows splits for the exact same player. I shouldn’t need to tell you that, obviously, sample-size issues are relevant. Broxton is not as good as he’s been lately. But this turnaround is jaw-dropping. 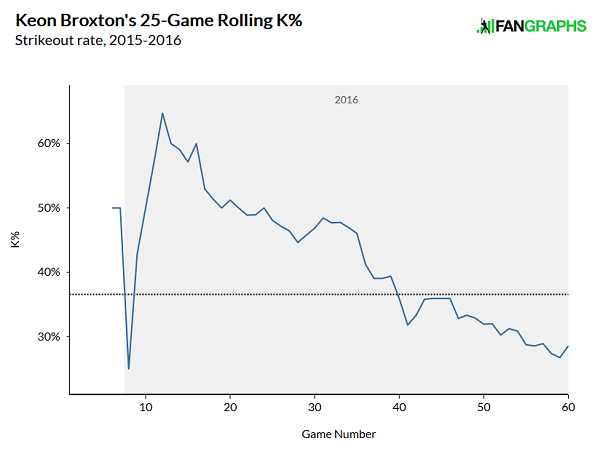 For the past number of weeks, Keon Broxton has been as good a baseball player as anybody. I’ve been holding out on you. I’m not just writing about Broxton because he’s a guy on a hot streak. Every player gets a hot streak. For pretty much every hot streak, there’s a cold streak. This is 2016. We can do better than just examining batted-ball and plate-appearance results. So turning to Statcast, via Baseball Savant — look at this leaderboard. That shows the top average exit velocities, given a minimum of 50 tracked batted balls. Keon Broxton is in first. Keon Broxton is literally in first place, a full mile per hour ahead of Nelson Cruz. Giancarlo Stanton’s in third. Keon Broxton, on average, has hit the ball harder than anybody. He’s killed his grounders, which doesn’t matter very much, but he’s also killed his non-grounders, which does matter very much. To play the arbitrary-threshold game — Broxton is one of just nine players with multiple batted balls in the air that came off the bat at at least 114mph. What the overall average demonstrates is that Broxton has good batted-ball consistency. What the peak demonstrates is that Broxton also has a high power ceiling. 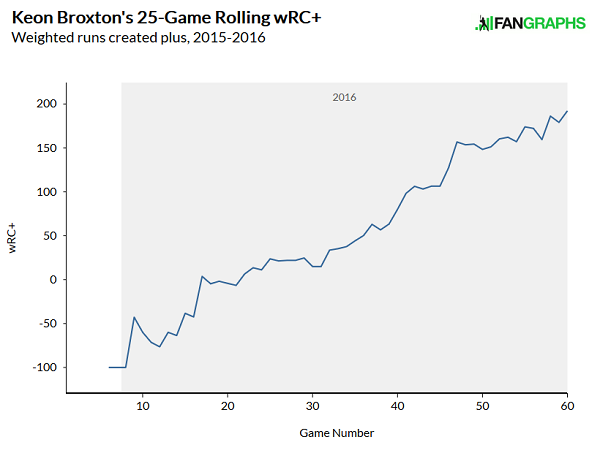 Before this year, you might not have ever heard of Keon Broxton. Thanks in part to Statcast, he’s a somebody. You can’t really fake how well he’s hit the ball. We couldn’t track that before. As I feel like I’ve pointed out a million times, I’m not an expert on swing mechanics. I can’t tell you how much this actually helps. All I can say is this: When Broxton’s hands were high, he wasn’t hitting. Since he brought his hands down, he’s been amazing. He hasn’t gotten way better at getting the bat to the ball, so much, but he’s gotten much better at hitting the ball fair, and hitting the ball well. He’s increased his fair contact, and he’s increased his air contact. Split-seconds matter. If Broxton feels like he’s cut a split-second or two out of his mechanics, it stands to reason that should help. And it clearly hasn’t cut down on his bat speed. That’s what makes this so exciting. We aren’t just pointing to a guy and saying “feels like he’s hit the ball hard a lot.” The exit velocity is what it is. It’s outstanding, and it reflects natural skill. It comes in a package with footspeed and defense, and so the tools here are elite. Presuming the strikeouts stay up, Broxton’s never going to be another Mike Trout. But what if he were like the best version of Colby Rasmus? What if he were like Chris Carter, but as an everyday center fielder? What if he were like Mike Napoli, but as an everyday center fielder? The floor, again, was already high. That was before we knew what Statcast would show. Now Broxton is more exciting still. If pitchers figure something out, then, well, so be it. If Broxton starts putting weaker batted balls into play, then, well, so be it. The problem with trying to identify these guys early is that you can end up looking wrong when the sample size gets big enough. Broxton, clearly, isn’t yet entirely established. But the Brewers made a high-profile move to get Lewis Brinson. They made a high-profile move to get Brett Phillips and Domingo Santana. They made a low-profile move to get Keon Broxton. Broxton might very well end up the best of the group. We hoped you liked reading All Aboard the Keon Broxton Bandwagon by Jeff Sullivan! I once ate a rib that a server dropped on the ground while working a BBQ restaurant patio. I’m not some kind of wasteful monster. And… FanGraphs LiveJournal becomes a thing. Though I think Cistulli established that a while ago.